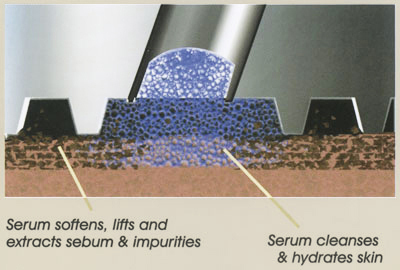 Hydradermabrasion, marketed as the Hydrafacial™ treatment is similar in concept to microdermabrasion, however there are differences such as the lack of any crystals used to assist in the exfoliation process, plus the use of a specially shaped spiral tip and vortex technology which exfoliates and removes impurities alongside delivering pneumatically applied serums that cleanse, hydrate and provide antioxidant infusion during the treatment process; something which microdermabrasion does not. Hydradermabrasion is indicated for the improvement in the appearance of fine lines, wrinkles, congested and enlarged pores (e.g., blackheads), oily or acne-prone skin and hyperpigmentation (i.e. dark areas of the skin, such as brown age spots). The procedure is used in combination with chemical peels, some skincare products, LED lights and different types of tips if a more aggressive treatment is needed. The average cost of a basic treatment is approximately £100, with advanced treatments including LED lights, peels and antioxidant serums ranging from £130 - £270. From the makers of the hydradermabrasion system HydraFacial®, the American based company, Edge Systems LLC, comes PERK™ - the world’s first hybrid facial. Microdermabrasion has been a mainstay of non-surgical skin rejuvenation treatments in clinics in the UK for over a decade now, as its minimally invasive technique and skin ‘freshening’ qualities are an attractive treatment option for many consumers. In the USA, over 8 million treatments were performed in the first decade of the new millenium, reaching a peak of over 1 million a year in 2004, making it currently the fourth most popular cosmetic treatment in America, according to the American Society of Aesthetic Plastic Surgery (ASAPS). Just under half a million treatments were performed in 2011 notes the latest data. Microdermabrasion involves a stream of fine, micro particles or crystals being blasted across the skin, normally treating the face, by a special handpiece as it is moved across the area. Movement of the crystals, usually aluminium oxide or sodium derivatives, at high pressure causes the exfoliation of the outer layers of the skin, similar to a mild sandpapering effect. Loosened dead skin particles, the crystals and other debris are then vacuumed away by the machine. Microdermabrasion is clinically used to improve the appearance of the skin, increase circulation and provide a ‘healthy glow’ as the remaining layers of skin increase their production of new skin cells to renew the surface layer. In many cases, specialist skincare products such as those containing antioxidants are also applied to the skin following the microdermabrasion treatment to speed up and increase this dermal renewal. However, like all non-surgical treatments, there are some minor draw backs. Although the treatment is generally considered to be painless, depending on how aggressively it is targeted, it does leave the individual with a tight feeling to the face and redness of the skin which can last for several hours as the inherent hydration of the skin’s surface has been stripped away briefly by the mechanical action. So scientists have been looking at ways to improve on this technology and not only increase its efficacy in terms of skin rejuvenation, but also remove any associated discomfort and downtime; and now they think they’ve cracked it with the introduction of hydradermabarasion, a crystal free alternative to microdermabrasion. Hydradermabrasion, with the Hydrafacial™ system uses patented Vortex fusion tips to deeply exfoliate and cleanse the skin, as well as extracting impurities and hydrating the skin using specific serums. If you are considering hydradermabarasion the following information will give you a basic understanding of the procedure. It can't answer all your questions, since a lot depends on the individual patient and the practitioner. Please ask a practitioner about anything you don't understand. What is hydradermabrasion and HydraFacial and how does it work? Hydradermabrasion, introduced by the innovative company behind the only example of this technology, the Hydrafacial™ treatment which became available in the UK in 2009, is indeed similar in general concept to its older cousin; however the primary difference is the lack of any crystals used to assist in the exfoliation process, and the use instead of a specially shaped spiral tip with vortex technology which exfoliates and removes impurities alongside delivering pneumatically applied serums that cleanse, hydrate and provide antioxidant infusion during the treatment process, (something which traditional microdermabrasion treatments do not). This makes it a much more advanced treatment than microdermabrasion. Hydradermabrasion takes its name from the word ‘hydrate’ meaning to ‘cause to take up moisture’. This ability to actively moisturise the skin during the treatment process sets it apart from all other skin resurfacing procedures available, such as microdermabrasion, chemical peeling and laser/IPL treatments. The special tip, which is the unique part of the Hydrafacial™ devices, is known as the Hydropeel™ Tip. 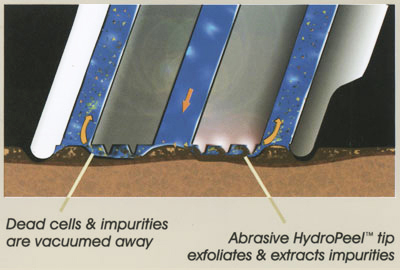 The treatment works differently from traditional microdermabrasion due to the spiral shape of the tip, which has multiple abrasive edges, meaning that the skin is exfoliated several times as the tip is moved over it in a planing motion, whilst the serums applied soften the skin and sebum (skin oils) making it much easier to extract away impurities. The philosophy of the company marketing the Hydrfacial™ system is Skin Health For Life™ which is not just about improving the appearance of skin, but actually restoring youthful, healthy skin. Skin Health is therefore about a lifestyle change, which requires monthly HydraFacial™ treatments and a daily commitment to the application of home care products. It is a monthly protocol to look after your skin and thus gain healthy skin. It can be described as a 'skin fitness', just like you might exercise and eat well for 'body fitness'. By achieving healthy skin, they note that you will achieve beautiful skin. The protocol for the Skin Health for Life with Hydrafacial is in 3 stages – a lymphatic stage, the Hydrafacial stage and the application of LED lights for the third stage. During the lymphatic stage, which is performed prior to the Hydrafacial, the treatment uses specific gentle lymphatic massage techniques via the application of a special suction handpiece or the practitioner's finger tips to assist in the drainage of stagnant cellular fluid and toxins. 33% of the body's lymphatic system is in the face and this process increases blood circulation and detoxifies, resulting in better overall skin condition. The proprietary serums used within the Hydrafacial MD™ range, which are delivered direct to the skin’s surface via the Hydropeel™ Tip during the Hydrafacial treatment, include activ-4™ which contains glucosamine and lactic acid, as well as active botanicals for cleansing and hydrating all skin types, beta-hd™ which contains salicyclic acid for cleansing and hydrating oily and acne prone skin, DermaBuilder™ a dual-peptide formula of Palmitoyl Dipeptide-5 Diaminobutyroyl Hydroxythreonine and Palmitoyl Dipeptide-5 Diaminohydroxybutyrate designed to help stimulate collagen production, improve cell structure and help smooth the appearance of fine lines and wrinkles and antiox-6™ an antioxidant treatment serum for all skin types containing hyaluronic acid, vitamins A and E, white tea extract and horse chestnut extract designed to combat the damage created by free radicals within the environment, and deeply moisturise the skin. The antioxidant property of the horse chestnut extract has been nominated as the second most powerful antioxidant in the universe after chocolate! A home care range is also available which is often recommended for use following a Hydrafacial™ treatment to enhance and maintain the results. Products include Antiox-6™ Daily, Pur Moist™ hyaluronic acid moisturising cream, Beta-hd™ Daily, DermaBuilder™ Daily and ETX™ Daily (Daily Eye Therapy X-Tract) which addresses dark under eye circles, puffiness and fine lines around the eye area. Additionally the Hydrafacial™ system offers a chemical peeling treatment in conjunction with the hydradermabrasion procedure. There are three Glysal™ peel strengths available, ranging from the Mild Glysal™ Prep which is suitable for most skin types as a pre-peel or preparation product, the Moderate Glysal™ Peel for oily, acne prone skin and to target fine lines and hyperpigmentation and the stronger Aggressive Glysal™ Peel. Following use of the Prep product, your practitioner will evaluate which of the moderate or aggressive peel products is most applicable to the condition of your skin. Finally red and blue LED (Light Emitting Diode) handpieces can be applied to the Hydrafacial™ treated skin to aid skin rejuvenation and acne treatment respectively. The energy delivered by red LED light has been shown to enhance cellular metabolism, accelerate the repair and renewal of damaged skin cells, as well as stimulate the production of collagen leading to improved skin texture and firmness. The red light handpiece emits 624nm red light and 880nm near infra-red red light. Unlike more powerful laser and IPL treatments there is no pain associated with the delivery of the LED light to the skin. The blue light handpiece emits 420nm blue light. Propionibacterium Acnes or P.Acnes bacteria is known as the cause of acne and porphryin which is a compound generated by P.Acnes is photosensitive and has been proven to react to the wavelength of 405 – 440nm (blue) light which leads to the destruction of the bacteria. The combination of Hydrafacial™ as a pre-treatment to the blue LED light means that dead skin and debris is removed first so that the blue light is better targeted at the acne prone skin layers beneath. What skin problems can this technique treat? Hydrafacial is generally a mild treatment causing minimal damage to the surface of the skin. Results are subtle and include a freshening in the appearance and texture of the skin. It is normally indicated for the improvement in the appearance of fine lines, wrinkles, congested and enlarged pores (e.g., blackheads), oily or acne-prone skin and hyperpigmentation (i.e. dark areas of the skin, such as brown age spots). This procedure is used in combination with chemical peels, some skincare products, LED lights and different types of tips if a more aggressive treatment is needed. Hydradermabrasion in the main is not suitable for deeper wrinkles and scars, deep hyperpigmentation problems or broken veins in the skin. Your first discussion with a practitioner should clearly set out your expectations and what the practitioner thinks will happen to your skin as a result of hydradermabrasion. A medical history should be taken, to ensure that there are no reasons why you shouldn’t have the treatment, and you would normally be asked to sign a consent form at this time which means that you have understood the potential benefits and risks associated with hydradermabrasion using the Hydrafacial system. If you have a history of herpes simplex infections (cold sores), an anti-viral drug may be prescribed as a precaution for the course of the treatment. The tip of the Hydrafacial™ device is passed over the surface of the skin in smooth, stroking movements, whilst the proprietary serums and/or peel products are simultaneously directed onto it and then vacuumed away, along with loosened dead skin cells and other debris. All the waste is retained in a separate closed container to avoid any risk of contamination. A new treatment tip is used per patient. The manufacturers of the Hydrafacial™ devices report that many people see visible skin improvement after just one treatment with the results and skin hydration lasting between 5 and 7 days, and sometimes longer, making it an ideal one off treatment for a special occasion or a ‘freshen-up’. However, a series of six to ten treatments are usually recommended for improving the appearance of fine lines, wrinkles, acne and oily skin or areas of hyperpigmentation, with ongoing maintenance treatments every 2 to 8 weeks. A treatment programme incorporating the various serums, growth factors, peel products and LED light will be customised on a per patient basis, depending on the individual skin requirements. How long will it take to recover from hydradermabrasion? Treatment usually takes approximately 30 minutes depending on the additional options used during treatment, e.g., LED light etc. Most patients find that they can return to work and normal activities immediately after treatment. What are the risks and potential complications from HydraFacial treatment? The treatment is usually painless and doesn’t irritate the skin greatly. A few patients may experience some slight tightness and redness of the skin, which may last for an hour or two following treatment. Treatments using peel products may prolong any redness however. On very rare occasions, redness may continue for a day or so and sensitive skin around the eyes can become swollen, but cold compresses will help to get rid of this side effect. The risk of any scarring is very rare with this procedure. What should you do after a HydraFacial treatment? Use any post-treatment skincare products provided by your practitioner which should include a sunscreen to protect the skin from the sun. Contact your practitioner if you notice any signs of infection or pigment changes. Who should not have a hydradermabrasion treatment? Treatment is said to be safe for most skin types and colours, including thinning or ageing skin, dry or oily skin and ethnic coloured skins; however those individuals who have been treated with isotretinoin for severe acne within the last 12 months, those with active skin infections, such as herpes simplex (cold sores), or with a history of problems associated with skin healing are not suitable candidates for treatment. Similarly, some medical conditions may be contra-indicated for the lymphatic drainage stage of the treatment protocol. Hence why a thorough medical history should be taken prior to treatment. Who can perform a HydraFacial? As with microdermabrasion there are some hydradermabrasion machines and treatments which can be found in beauty salons and spas and which can be used by trained beauticians. There are also some more aggressive treatments (using different tips, peels etc.) that can have a deeper effect on the skin that are designed for nurses’ or doctors’ use only. What is the average cost of a HydraFacial Treatment? The average cost of a basic HydraFacial™ treatment is approximately £100, with advanced treatments including the use of LED lights, specific antioxidant serums and peel solutions being more, ranging from approximately £130 - £270; generally discount packages are available for a course of treatments. The popularity of microdermabrasion as a long term treatment programme for maintaining a healthy glow to the skin to reduce the appearance of fine lines, wrinkles and sun damage is well established, along with its versatility as a one-off, special occasion treatment when you want to look your best for a wedding etc. With the introduction of hydradermabrasion using the Hydrafacial system many within the industry are seeing this as the next generation of minimally invasive skin resurfacing which moves on from traditional microdermabrasion by offering a painless treatment with less post treatment redness, along with the pneumatic application of antioxidants directly to the skin during treatment, rather than by topical application post-abrasion. A number of clinical trials into the use of hydradermabrasion and the associated application of antioxidant serums, both as a stand-alone treatment and in conjunction with other non-surgical skin rejuvenation procedures, such as Intense Pulsed Light (IPL), have been carried out by influential American physicians Dr. Patrick Bitter and Dr. Bruce Freedman. A study by Dr. Freedman involved 20 volunteers being split into two groups, one group had six hydradermabrasion treatments using the mechanically applied antioxidant serum, spaced 7 – 10 days apart, and the other group simply had the serum applied manually, again for six treatments spaced 7 – 10 days apart. Results gathered two weeks after the final treatment showed that the group treated with hydradermabrasion demonstrated increased thickness in the skin layers, with the deposition of new collagen fibres and increased levels of antioxidants in the skin. Fine lines, pore size and hyperpigmentation were also decreased following treatment. The other group showed no change in skin structure, clinical attributes (such as wrinkling, hyperpigmentation etc.) or antioxidant levels. It was therefore concluded the Hydrafacial™ treatment effectively improved skin quality and increased the antioxidant levels present in the skin, whilst the lack of an abrasion element and a manual application of antioxidants did not result in detectable skin changes. If we are to criticise this study in any way, it would be to note that a third group was not established who were treated with traditional microdermabrasion and topical antioxidant application, so as to establish the exact effect of the differing types of skin abrasion (wet versus dry) and the subsequent take up of the serums by the skin. In a study by Dr. Bitter, presented at the ASLMS conference in 2009, he looked at how hydradermabrasion worked in conjunction with IPL on facial skin. Two groups of patients were treated with either a series of IPL treatments alone or a combination of IPL and hydradermabrasion. In the combination group, results showed that fine lines, texture, pore size and overall skin appearance were improved. This study showed that hydradermabrasion appeared to enhance the effects of the IPL, which was due to the antioxidant infusion which is part of the Hydrafacial™ treatment’s uniqueness. Although the Hydrafacial™ systems are becoming the most widely known and heavily marketed devices within the hydradermabrasion arena. There are some other systems available which also use the concept of high pressure fluids to exfoliate or hydrate the skin as part of an abrasion treatment. Images courtesy of Edge Systems. Click for ALL HydraFacial ™ - Hydradermabrasion clinics in the UK & Ireland registered and verified by Consulting Room.